The National Arts Council has turned down an application by Sunset Sound Production to bring in the country South African entertainer Zodwa Babantu. 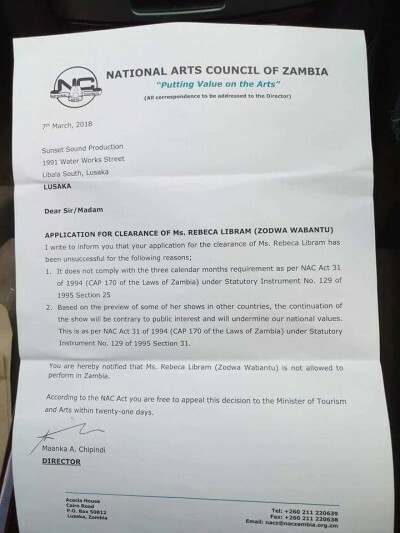 The National Arts Council (NAC) claimed that allowing Zodwa to perform in Zambia will be against the country’s national values adding that the application did not meet the three months period in which to apply for clearance. NAC further said Zodwa’s performance in Zambia would be against public interest. Zambian musician Karasa Karayo is scheduled to launch his album on 10th March 2018 and the promoter for the show Sunset Sound Production has lined up South African entertainer Zodwa to perform at the launch. Zodwa performs her dances without putting on under wear. NAC told the promoter, Sunset Sound Production to appeal to the Minister of Tourism if they are not satisfied with the decision to turn down their application. The promoter has since appealed to the Tourism Ministry through a letter addressed to the Permanent Secretary Howard Sikwela who replied that only the Minister of Tourism could make a decision on the matter but he (Minister) was out of the country. The promoter claimed in the letter of appeal that the National Arts Council did not give them an opportunity to be heard adding that the two grounds were not sufficient to warrant denial of clearance.